Happy Government take the rest of your money...I mean Tax Day! If doing your taxes has got you down, here is some places that are going to help you out today and get you some free or really discounted stuff! AMC is giving away a free small popcorn (which is probably $17 worth in their calculations!) Make sure you go to their website and print the coupon! Free popcorn coupon! Panda Express is giving out a free single serving of Samurai Surf and Turf. Must print the coupon! (This one is only available on Wednesday April 17th!) Free Samurai Surf and Turf! Sonic is offering Happy Hour (Half Price) drinks and slushes all day on April 15th! Great American Cookies are giving away one free birthday cookie on April 15th! HydroMassage is giving out a free HydroMassage starting April 15th- April 19th. They suggest you call ahead and reserve a time! Enjoy all your discounts and freebies! Emma Watson...Pole dancing bad girl? Oh, Emma Watson has grown up so much since her days as the magic-making Hermione. She is starring in a new film called "The Bling Ring" and is getting quite a buzz! "The Bling Ring" is a movie by Sofia Coppola and is based on the actual events of a group of young adults who steal from celebrities like Paris Hilton. "I did learn to pole dance for the film, and I have a small pole dancing scene. But it’s not a performance for anyone else, it’s just me messing around with my friends. I took lessons. I had this surreal experience where I was studying the modernists, writing about Virginia Woolf on Friday night, then driving to London for pole dancing classes on Saturday morning. I was incredibly ungraceful at first. The upper-body strength and the core strength you need to do it gracefully is crazy. I take my hat off to the women who can do it. You have to be incredibly strong." Ever wonder what exercise you can do at home that will help your pole skills? We have all the moves you need right here to help you gain strength for inverting, climbing and anything else you may have trouble with on the pole! The most important thing is a strong core. With a strong mid-section, you can do more things on the pole with a lot less effort. First try five planks (pictured below) in 30 second intervals. 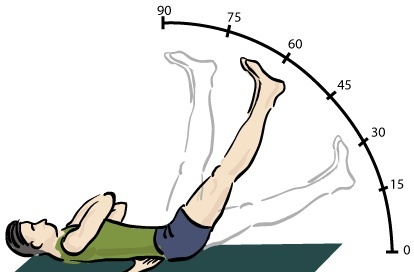 This really works your core muscles as well as your shoulder and thigh muscles! Make sure your bum isn't too far up or down, otherwise you will not get the same results. Your body must be properly aligned. Planking works all these muscles! Another great core workout is leg-lifts. These are simple enough, but do about ten of them, and you'll start to feel the burn. Just lay on your back, and then lift your legs up and down while your hands are kept at your sides (pictured below). Keep your head and shoulders on the ground. To make this a little easier, hold onto something behind your head, like a couch leg, or something stable that won't fall or tip over. We recommend starting with 5 sets of 20. Make sure you go all the way to a 90 degree angle! Make sure you twist at the core and BREATHE BREATHE BREATHE! Something that is similar to the twisting crunch is a Russian Twist. A Russian twist (pictured below) with your legs bent, your feet can either be placed on the ground to make it easier or twisted at the ankles for a greater challenge. Bend at the waist and twist from one side to the other. Go back to starting position and do it again! I like to hold a medicine ball or a weight to really get a good workout! We recommend starting out with 5 sets of 20 and working your way up! Another important part of your body to strengthen is your arms! Arm strength will make your pole moves effortless! Well, maybe not effortless, but a hell of a lot easier! The best thing to do for your arms is push-ups. 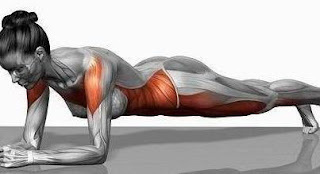 If you have never heard of or seen a push-up done, get out of the house! The steps are super simple. Start facing down with your arms extended DIRECTLY beneath your shoulders holding yourself up. Bend your elbows to your SIDE and lower your body as CLOSE to the ground as possible without touching it. Extend your elbows back to starting position and raise your body back up. We recommend starting out with 3 sets of 15 and working your way up. A one-arm side push up is great for the arms as well! 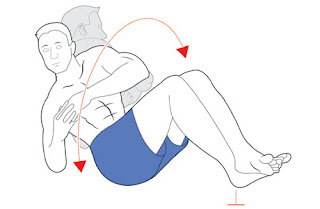 Just sit on your side, put your hand with the shoulder facing the ceiling on the ground and cross your other one across your body (This sounds more complicated than it is, just look at the picture!). 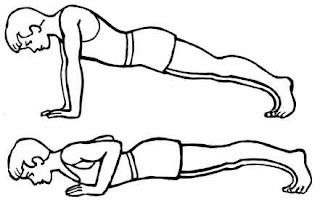 Push up with the arm on the ground and bend at the waist. Do 3 sets on each side of 15 and working your way up! There are many things you can do to help your strength! Ask your class instructor for more in-home exercises to make you stronger! If you have any suggestions, put them in the comments! We love to hear from our readers! Cocktails for a girls night out! Shake all ingredients over ice and strain into a chilled martini glass. Garnish with a slice of orange and serve. Shake all ingredients over ice and strain into a chilled martini glass. Garnish with a cherry and serve. Mix together in a glass filled with ice and top with Redi whip; make sure to leave enough space at the top of the glass because the drink will overflow when you stir in the whipped cream.Garnish with a cherry (optional). 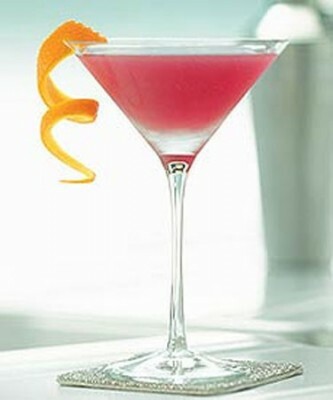 To make this into a shot or martini just strain into shot glasses or a large martini glass. Remember to share your cocktail recipes and enjoy safely and in moderation, always designate a driver when out and enjoy the whipped vodka adult orange creamsicle drink recipe. Pour 2 tablespoons lime juice into a shallow dish. 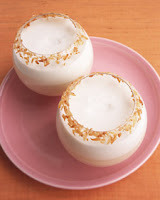 Place coconut mixture in another dish. Dip rims of two cocktail glasses in lime juice, then in coconut mixture, coating well. Combine remaining ingredients with 1 cup ice in a blender; puree until smooth. Divide evenly between prepared glasses, and serve immediately. Place 10 oz of the champagne and sugar in a sauce pan and then sprinkle gelatin on top. Let gelatin soften for about 2 minutes. Place saucepan over low heat and stir until gelatin has completely dissolved, about 2-3 minutes. Remove from heat and add in remaining 5 oz of champagne and stir to combine. Pour mixture into a loaf pan (I used a square tupperware container) and chill for at least an hour. To release Jello, dip the pan into warm water and use a knife along the sides to gently release the Jello. Use a sharp knife to cut squares. 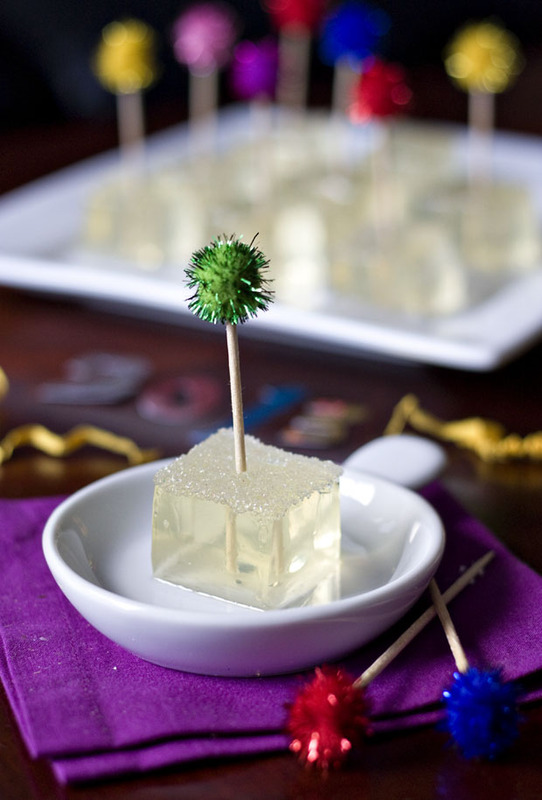 Before serving, dip the tops in the sparkling sugar and serve with a festive toothpick. 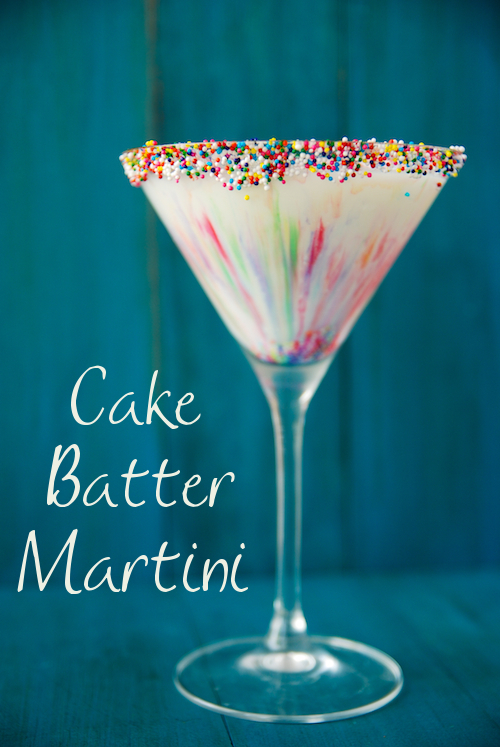 Place sprinkles on a shallow plate that is a little larger than the mouth of your martini glass. 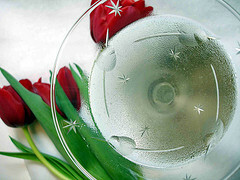 Dampen a paper towel with whipping cream (or water) and wet the rims of the martini glasses. Dip glass into sprinkles to coat the edges. Combine all ingredients in a cocktail shaker with ice and shake for about 30 seconds. Strain into martini glasses and drink! Make ahead: For a big party, mix up a big bath of these martinis and store in a large pitcher in the fridge. Shake a glass at a time over ice whenever ready to serve! These are just a few of our personal favs! Tell us about your favorite cocktails! And don't forget to follow us on Pinterest for great party ideas!